On Saturday - while umpiring Skitterleap - I took the opportunity to get a game in against John Tailby and his Dark Elves. We decided to play 3000 points. John's list had four big infantry blocks - Witch Elves, Executioners, Corsairs and Spearmen - a bunch of Warlocks, two units of Harpies, Shades and a selection of characters. His general was a Dreadlord on a steed with kit and Chillblade (Warlocks), a BSB in Execs, Pegasus Master, Level 2 Dark Mage (also in Execs) and Level 4 Fire in Spears. It was rounded out by two RBTs. 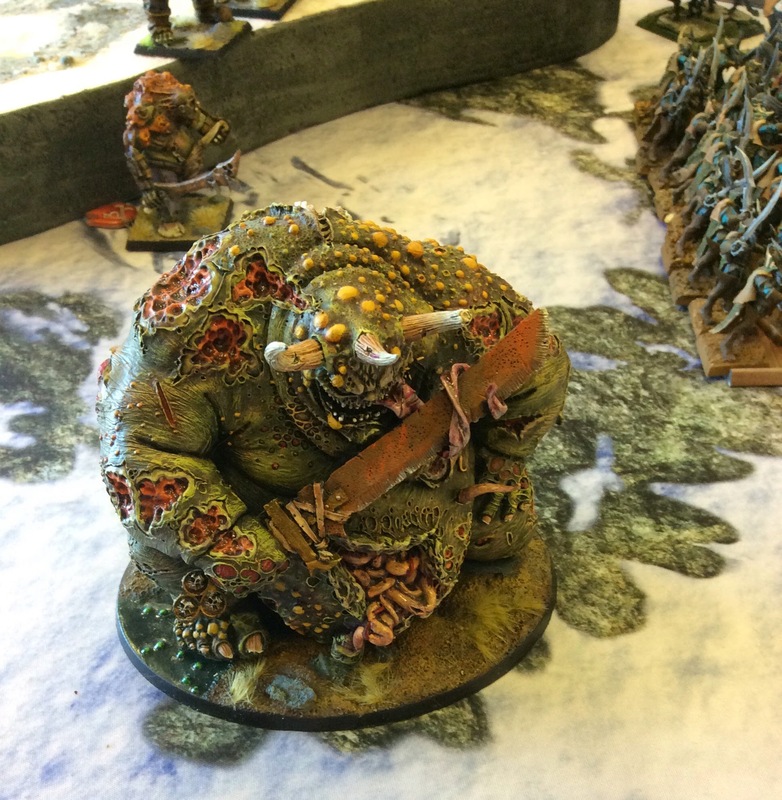 I had GUO Level 3 Nurgle, Nurgle Herald BSB and Epidemius as character selections. 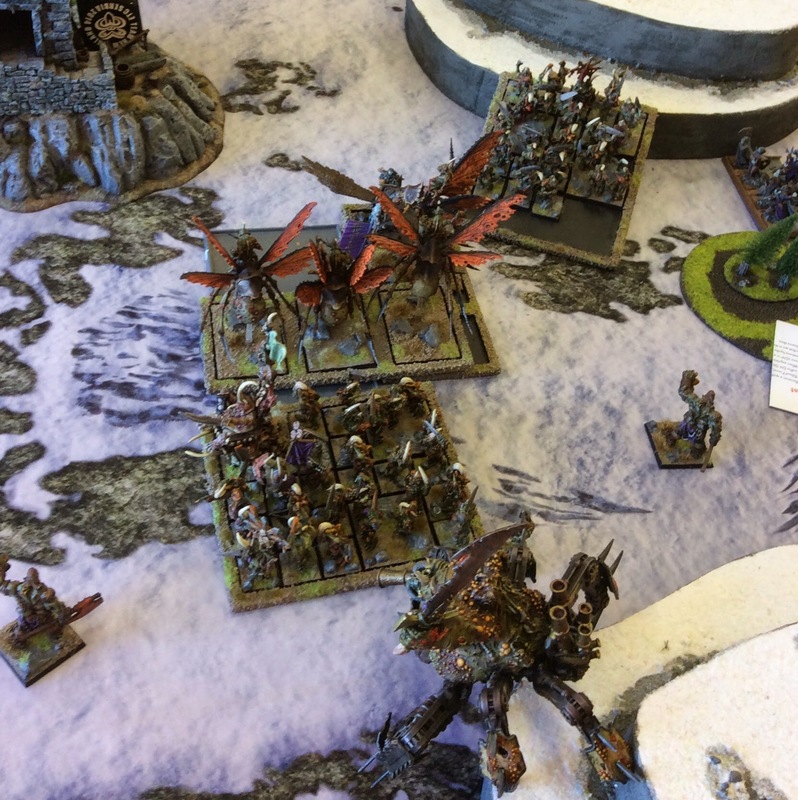 Rest of the army was 2x mid 20s blocks of Plaguebearers, two units of Nurgle Furies, 6 Beasts and two single Beasts, two 3x Drones and a Soulgrinder with MoN. So the whole 3000 points was Nurgle. We rolled up Battle for the Pass. Looking at John's army I thought he had the tools to take me apart. This would be a lot easier if he removed Epi early. Both his Pegasus Master and Dreadlord had the tools to do it, so I was happy when he deployed them on one flank - all my characters went on the other. I managed to get the tally to 5-6 on Turn 1 but in Turn 2 it went to max as the Executioners (magic, shooting then combat vs Drones) started to take damage. The Beasts had charged the Witch Elves Turn 1 and started to rip them apart - especially when they lost Frenzy and had to fight the Beasts with tally up Turn 2. John got unlucky when his Level 2 cascaded and killed 6 Executioners that had charged the Drones. This was compounded when his Master with the Cloak of Twilight fluffed his attacks into the flank of the Drones. 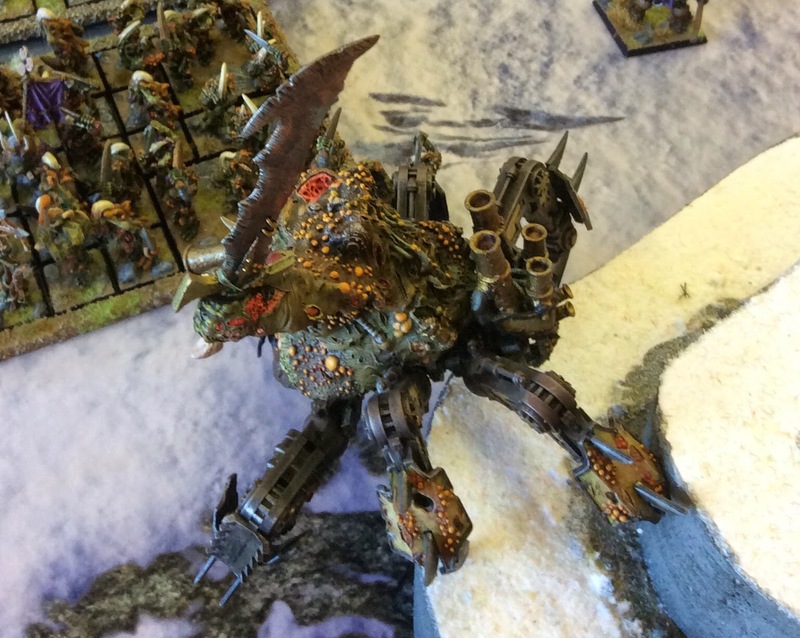 From here, a second unit of Drones was able to countercharge the flank of the Executioners, killing them and the BSB. On my left, Big Poppa Nurgle charged the Horde of Corsairs and though he only did 4 wounds he broke them in combat, running them down. Fully tallied now, the Beasts finished off the Witches, running them down and falling on the RBTs. This left the Spearmen - now ensconced in the tower - as the only infantry block left. The Warlocks and Dreadlord had cleaned out my chaff and were now in my back field but with the three infantry blocks gone, John's options were limited. What is good in Life? Baleful Torrent! In the wrap-up it was a solid victory for the Forces of Good. The key lesson...you need to get Epi early. Once the tally is up and running the combination of +1 St, +1 T, Killing Blow and Re-roll Wards is......unpleasant. Somehow I missed getting any pics of John's army which is looking very very nice. Nice to see Dark Elves with solid infantry blocks. Torrents just work like Flame Throwers. Its only if you roll a misfire, then the Soulgrinder takes a wound with no saves of any kind. Thanks Sam...thankfully it didn't impact game...Warlocks survived and got away. That GUO is awesome... good to see him in action. He would make a good Glotkin stand in if you wanted to try him out.